We’re proud of the way we manage our funds! This little foal needed a fighting chance to survive — so that’s what we named him. Friends like you helped Chance grow and thrive. 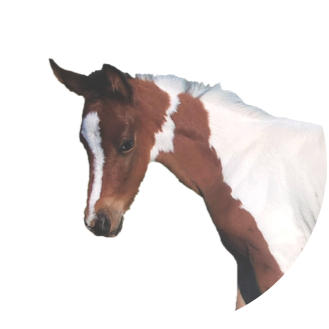 Please make a holiday donation to make more miracles for horses who are suffering. Give before 12/31 to secure your 2018 tax deduction. Don't forget, if you give $100 or more or make a monthly gift of any amount, we'll add your name to our garden walk. Yes, please add my name to the garden walk. To add your name to a garden paver, please select your one-time gift of $100 or more, or choose monthly giving. And thank you!